An online news portal, which brings latest updates from Technology, Science and Health. The pc-gadgetworld also focuses on unbiased reviews of Apps and Gadgets. Not only India but also worldwide the tablet market is growing rapidly. In March 2011 Steve Jobs announced the iPad 2 tablets and said it's a "post - PC device. He also said that one day the world do the work on it then it feels strange but it is changing because the PC has been with us a long time so it will happen. If we accept the knowledge data sources and expert advice then Steve Jobs were right in their place. Because it turned out to be changed. According to a report released in last year in U.S. Market research firm International Data Coprereshn (IDC) in March 2013, The sales of the tablets in 2012 is 78.4 percent. This year 12.8 million tablets were sold worldwide. According to an IDC report , This is just the beginning in 2013 sales of the tablet computer sales will overtake. 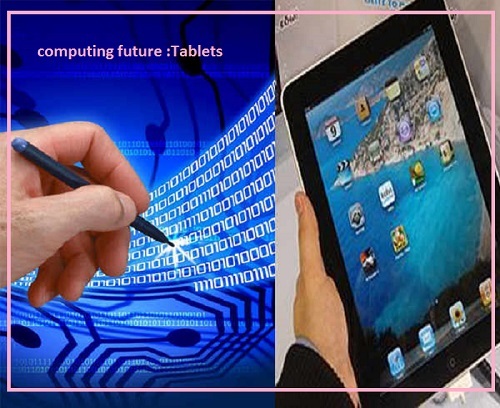 Moreover by 2014 sales of tablets will overtake the sales of portable PCs. According to expert advice in place of centric board keyboard mouse. Indeed, Touch Computing 'Natural User Interface' is placed efficiently and attractive way. That means more natural way of using this method electronics, which is much simpler. That is believed to be the future of tablet computing. On the other side of the mouse and the software industry in the last 30 years - board software is designed primarily for the device. Now the focusTouch computing has been on the platform. Because The future seems bright of Tablet computing.